Should the Baltimore Ravens Draft Another Running Back? The 2018 season is over for the Baltimore Ravens, and it is time to begin the yearly roster evaluation. This year, we will go through all 10 positional groups and evaluate the state of the group, and make recommendations on what the Ravens need to change this offseason. In today’s article, we will take a look at the running backs corps. Here are the six running backs that were on the 2018 roster. What Moves Should the Ravens Make on the Roster? The move of highest priority for the Baltimore Ravens is to re-sign exclusive rights free agent, Gus Edwards. In his rookie year, Edwards burst on to the scene once the Ravens realized the potential of pairing him with quarterback Lamar Jackson. Baltimore can re-sign Edwards for the league minimum salary of $570,000, a bargain deal for a prospective starting running back. The Baltimore Ravens should then work on re-signing Ty Montgomery. Baltimore traded a seventh-round pick in the 2020 draft for Montgomery and want that investment to be worthwhile. In Baltimore, he showed off his ability as a swiss army knife type player in the mold of Kyle Juszczyk. Montgomery can run, block, and catch. Retaining Montgomery would also give a veteran presence around in a very young running backs room. The Ravens could likely sign Montgomery on a 2 year, $5-$6 million contract. If the Ravens rather go younger and cheaper, Baltimore could retain De’Lance Turner, a similar player, for just $570,000 next year. 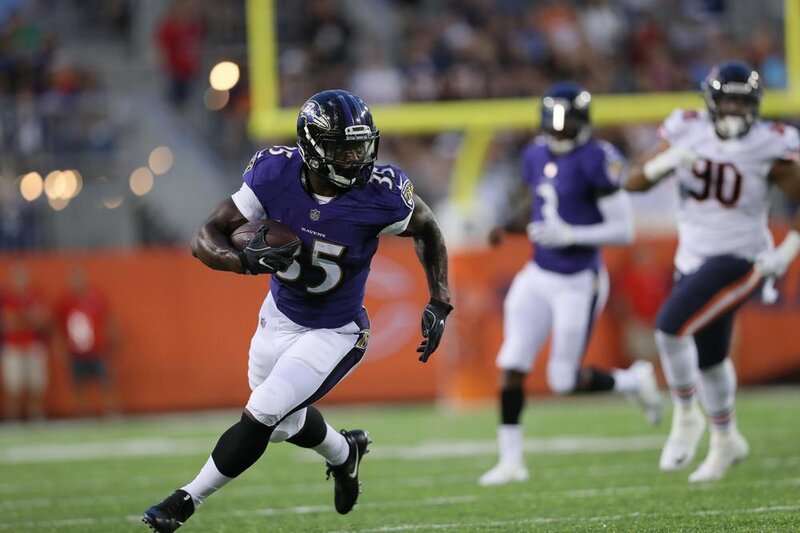 The Ravens do not need to bring in a new running back as long as they re-sign either Ty Montgomery or De’Lance Turner this offseason. If by some strange circumstance, the Baltimore Ravens opt not to bring back Montgomery or Turner, there are two options that the team can explore in free agency. The first is Ameer Abdullah. The former Detriot Lion signed with the Minnesota Vikings during the 2018 season after a disappointing stint in the motor city. Abdullah is a quick, side to side rusher, that also excels as a receiving back. Abdullah will be an unrestricted free agent this offseason, and will likely be a very inexpensive pickup. I could see the Ravens signing him to a one year, $1 million deal. The other player the Ravens can target is Atlanta Falcons running back, Telvin Smith. Smith is a fantastic receiving back, but his price tag is much higher than any other back on this list. Spotrac.com estimates his market value to sit at $5 million per year, and he would likely need long term security in a 4-5 year deal to be lured to Baltimore. Again, the most likely scenario is the Ravens sit out of the market and re-sign Montgomery and/or Turner. Do the Ravens Need to Draft a Running Back? Short answer: Maybe. Long answer: It would be a smart move for the Baltimore Ravens to draft a running back in the higher rounds, but the team would need to be comfortable spending a second or third round pick on another rusher. The Ravens often come across a running back that performs at an extremely high level in his first year in Baltimore. But by year two, that running back returns to mediocrity. The Ravens have seen this with Justin Forsett (2014-2016), Terrance West (2015-2017), and Alex Collins (2017-2018). This same scenario could play out with Gus Edwards. If the Ravens don’t buy an insurance policy in a high round running back, it could stunt the ground game. One prospect the Ravens could target is Benny Snell of Kentucky. The junior rushed for over 1,000 yards in each of his three seasons at Kentucky. Snell is currently projected to be picked in the second or third round.